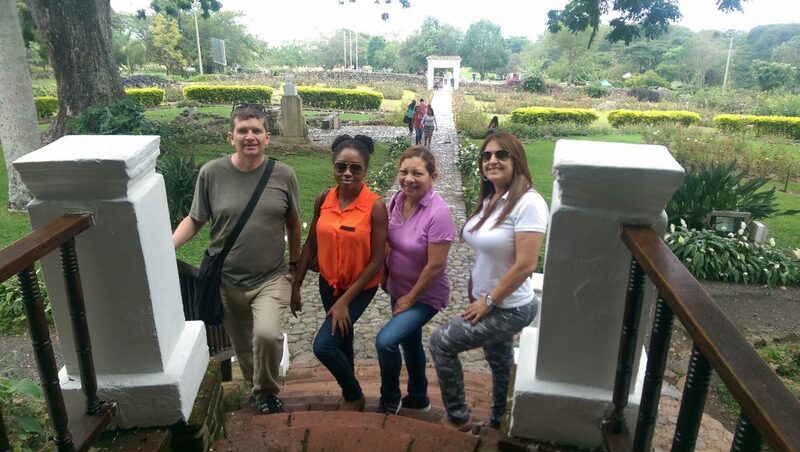 The city I am living in, Palmira, is in the South West of Colombia in a department called Valle Del Cauca. The valley stretches from El Eje Cafetero (The Coffee Region) at its North Eastern point down and across to the Pacific Ocean coast in the West. Where I am the valley floor is a wide plain about 1000 metres above sea level, making it cooler and more tolerable than it is at sea level. This means average days in the high 80s to low 90s. Down by the coast it gets warmer and much more humid. Palmira itself is resolutely not a tourist destination, but we have been blessed by living close to some pretty cool places to visit for the weekends. There are mountains to the North and East of Palmira. The countryside here is cooler again and some of our teachers have fincas up in the hills. When we first arrived Maritza and her husband took Max and me, as well as our mentor and co-teacher Martha, to their place near Paradise. Hacienda El Paraiso is a finca where the writer Jorge Isaacs lived. It is also where he wrote and set his novella Maria. It is now a museum and we spent a pleasant hour walking round it and being given a guided tour. The house is in a traditional finca design. A central entrance hallway has the common living and dining rooms off it and bedrooms behind, with a separate outhouse for the kitchens and the workers. 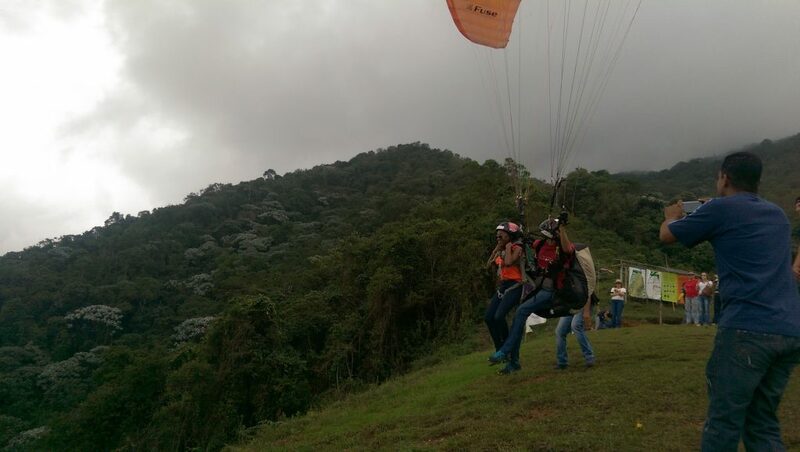 We had seen people paragliding onto the grass in front of the finca while we were exploring it and when we left Max negotiated a flight with them. We drove up to the top of the hills behind the finca, Max was strapped in with her pilot and then they ran off the edge. After that we visited Maritza’s finca, which turns out to be the biggest house I think I’ve ever seen. 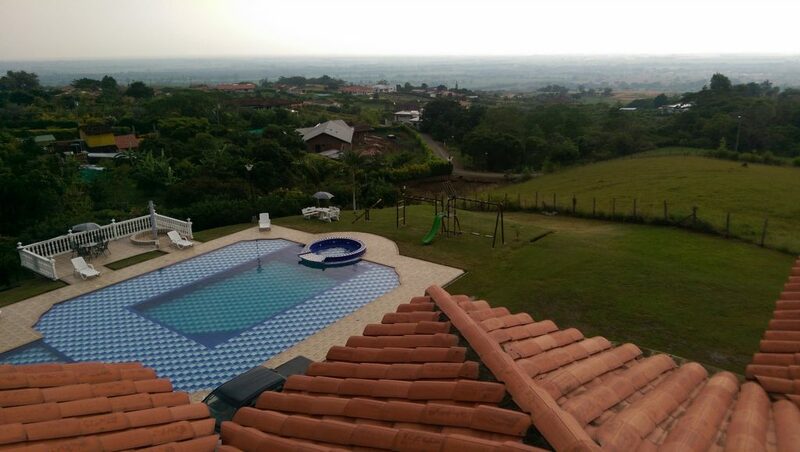 Three storeys high and with a separate party terrace and pool, it has amazing views out across the valley. Not to be outdone by Max’s aerial dramatics, and to prove that she isn’t the only one with a head for heights, I climbed the whole three storeys and took this picture from the roof. To the west of us is the capital of Valle del Cauca, Santiago de Cali, more commonly referred to as just Cali. It is less than twenty minutes down the road from Palmira. Cali is Colombia’s second city after Bogota, which I suppose makes Palmira a bit like Coventry. Anyway, Cali is bounded by hills to the North, South and West. You can be in the city and look round and it feels as though the whole city is enwrapped by these mountainous shoulders. 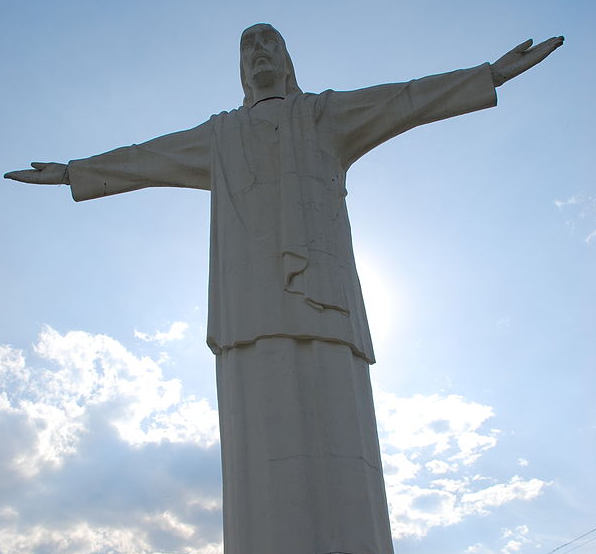 Cali wears its Catholicism with pride and has both its own Cristo Rey statue on top of one hill as well as Tres Cruces (Three Crosses) on top of another. Both are lit up at night. One weekend we stopped at a nature reserve in a place called Pance which is high up in the hills on the other side of Cali. To get there we caught the bus to Terminal in the North of Cali and then crossed the street to get the local bus to Pance. From there we went south through the city before taking a turn off and heading up some hills to the west. We were already quite full by this stage, but the driver was keen to maximise his takings, and it was the last bus of the afternoon. So, we stopped to take on a few more people, then a few more people, then somebody’s big bag of shopping and a final coup de grace of a bushel of coriander squished through the side window and delivered to the couple in front of us. It was a fragrant journey. The countryside is quite stunning and we followed the river as we climbed up the road. At one point we passed a waterfall with a small pool underneath it. Children ran along a wall by the bus and jumped into the glistening water. It was truly like being in a holiday advert at that point. The bus stopped and did a three-point turn. Everyone got off and so we joined them. Over the bridge we sat drinking mango smoothies and watching a man shave in the shelter of some rocks in the river, before asking the owner for a recommendation of where to stop. She gave us a card for a nature reserve a couple of miles further up the hill. Of course it was further up the hill. When we got to the nature reserve we discovered that all of the chalets were fully booked, but if we walked another half mile up the hill …… We were just thinking that the accommodation had better be worth it when we reached our destination. 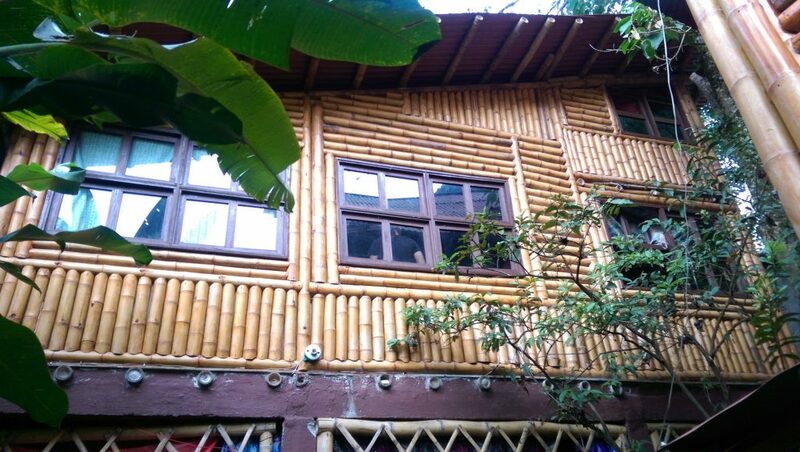 We stopped in a bamboo house just a few yards from a raging river. There was even a stream that ran under the house and then down the hill through the reserve. Lots of people were camping out and there were some cabins down by the pool as well. It was lovely and peaceful. I spent a lot of Sunday sitting outside on an armchair, watching the world go by as well as marvelling at all the different butterflies that were fluttering by. Reluctantly, we made our way back to the dusty streets of Palmira on the Sunday afternoon, but spent the working week buoyed by the memories of our idyllic weekend retreat. 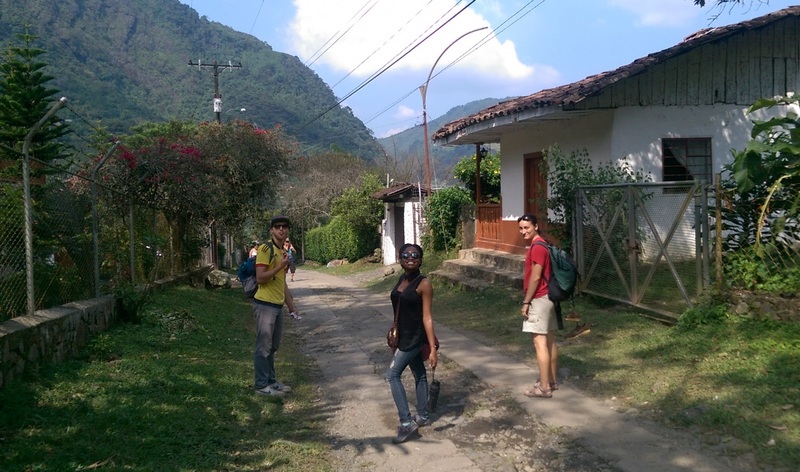 There are more photos from our trip to El Paraiso as well as photos from Pance in the gallery. Ahha. We used to call it the Alli, no mas phenomenon. Lovely. Jealous. Biy distyrbed teachers live in mansions.